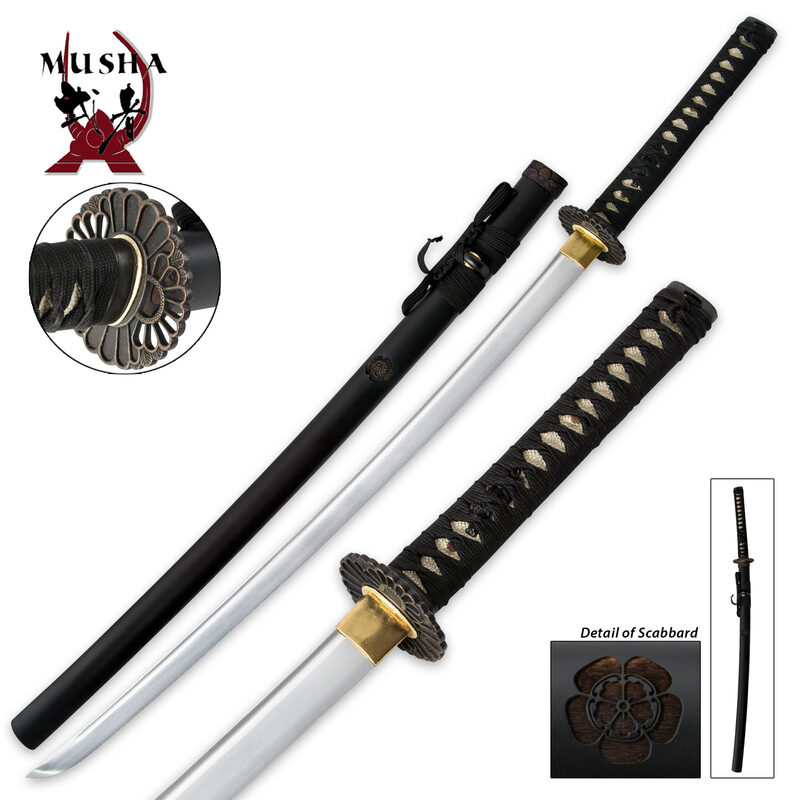 Musha Bushido Genko Samurai Katana Sword 1045 Carbon Steel | BUDK.com - Knives & Swords At The Lowest Prices! The Bushido Genko Samurai Katana offers a hand-forged, 1045 carbon steel blade that rivals the sharpness of most $500 katana swords. But, this katana was constructed with more economical handle materials to allow for it to be an extremely effective martial arts sword, with a rock-bottom price tag. What this sword lacks in fancy decor, it makes up for in pure slashing and slicing power. Buy yours today and we promise you won't be disappointed! I received this sword last week, it's just like all the other reviews. It actually came out of box, pretty damn sharp. I sharpened it slightly more and its a 3 ft long razor blade now. I haven't took it out and slashed any zombies with it....YET ... but it seems durable enough for the job. I do believe in you get what you pay for, but this Katana is an exception. It is well worth the $40 I paid for it...so yeah, I would recommend it. Very happy with this sword, it wasn`t too expensive, it is very well constructed, and comes sharpened. Would definitely recommend it! I love my Musha. It's well made for the low cost. I touched up the edge on mine. It's now a slicing machine. Good, solid, useable katana for a backyard cutter like me. Just buy one, dummy. I have owned this sword for about 9 months now, and I'm still every bit as impressed as I first got this sword. when I first unboxed the sword, and picked up the sword, it had the best feel and quality of any sword in it's price range (20-50 dollar range is what I'm comparing to). Here is what I like and dislike about the sword: I'm For: The incredible quality for it's price range, I've seen some 80 dollar swords (double this sword's price) that don't perform nearly as well as this. The handle fittings are good quality. I've seen 80 dollar swords which are not nearly as well balanced as this sword (some more expensive swords I've had feel like swinging a sledgehammer!) Decently sharp blade. I'm Against: The fittings, though high quality, are made of copper, and if even a single drop of water gets on the tsuba or other fittings on the sword, the fittings oxidize green, not too big of an issue, but if you plan on testing this sword on a rainy day in Oregon, just be aware of that! the blade, though high-quality for it's price, it still only 1045, again, not too big of an issue, just don't cut anything harder than tatami mats and you're fine, but on durability testing of this sword, I bent the blade ever-so-slightly slicing through my ballistics gel targets with leather armor. 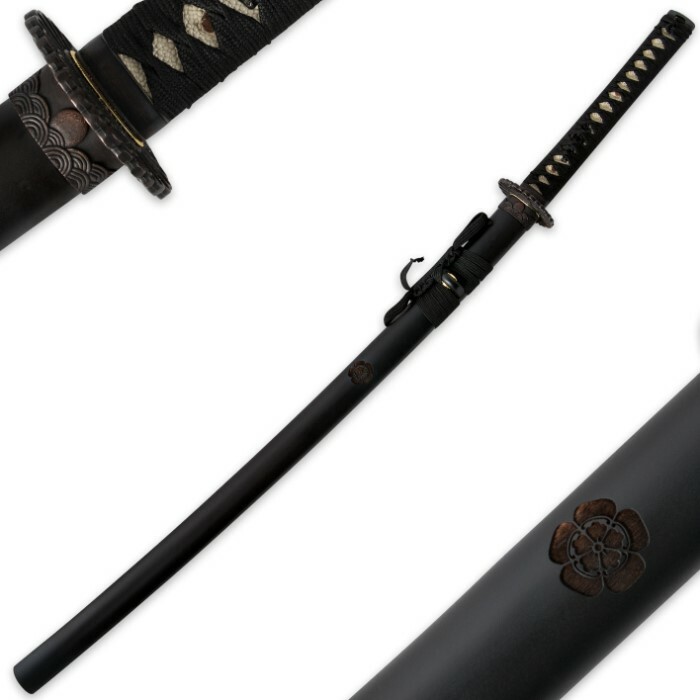 Some things you should do if you plan on getting this sword to cut tatami mats and other things: - Make sure to sharpen this sword to as sharp as the blade can get, this is a cutting-oriented steel, not durability-oriented. Meaning, without an extra sharp edge, the blade takes more damage than it should. so grab a good sharpener and use it! - Wear gloves while using the sword, the reason is the handle is made of silk, meaning it will catch every drop of sweat, and eventually get all soggy over the months. This can be fixed by wearing thick gloves, that and you should wear thick gloves anyway cause safety first! - don't cut anything tougher than cardboard boxes or tatami mats, when I tested on thick targets, the blade bent slightly, I was able to fix it, but I recommend you don't cut any hard materials like bamboo or wood. - Make sure the handle wrapping is snug and secure after testing, it tends to get loose, if you don't fix it, it will unwrap itself after a couple swings and eventually you'll have to go through a boring process of re-wrapping the handle. My expectations were surprisingly exceeded. I wasn't expecting much for around 50 dollars(with shipping and handling). Everything was very uniform and straight, however the blade was slightly curved to the right. But it was very slight, I had to really look for it. The tang seemed to be full, I did locate the bamboo pegs, but I still haven't swung the sword at full strength. I'm sure it would hold up, but I'm not quite ready to try it (also not mentioned in the description was the specific kind of carbon steel, but I can tell you it's 1045)The blade was pretty dull (not "very sharp" as advertised). The pros outweigh the cons though. It was actually a very detailed katana and though you can't see it well in the picture, there is a dragon design on the handle of the sword. The sheath is covered with a matte black coating that I surprisingly like. The shipping was nice and quick, and it came on the shipping day determined. For the money, I definitely give this five out five stars. Just got it today. Love it! It came with a sleeve so that was cool also very nicely weighted, sharp, everything was held together nothing loose. My one concern was the swords sheath, don't get me wrong beautiful design but the blade doesn't slid in like I thought it would if you shake it the blade won't come out but it wiggles. Overall beautiful sword, great price, just need to fix the sheath my opinion. Great sword, especially for the price. I cut a few waterbottles and a gallon sized one too. Lovin this sword so far.